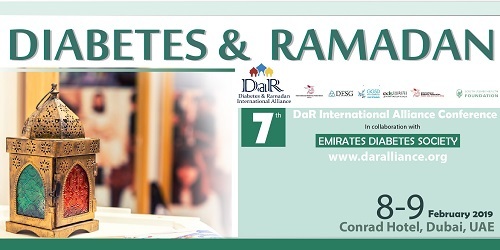 Stay tuned for upcoming events for Diabetes and Ramadan Conference in near future. Ramadan is the ninth month of the Muslim calendar and the daylight fasting that accompanies it is one of the five pillars of Islam. Fasting during Ramadan is compulsory for all healthy adult Muslims, although exemptions exist for people with serious medical conditions, including many with diabetes. Nevertheless, a majority of individuals with diabetes see the fast as a deeply meaningful, spiritual experience, and most will participate, sometimes against medical advice. The International Diabetes Federation (IDF) has described diabetes as “one of the largest global health emergencies of the 21st century”. 1 - This global epidemic includes countries with sizeable Muslim populations, where the comparative prevalence of diabetes is well above the global average. Of further concern, the number of patients with diabetes in these countries is predicted to rise dramatically over the next 25 years. 2 - Ensuring the optimal care of the many patients with diabetes who fast during Ramadan is crucial. The IDF and Diabetes and Ramadan (DAR) International Alliance have therefore come together to deliver comprehensive guidance on this subject. The IDF-DAR Practical Guidelines provide healthcare professionals (HCPs) with relevant background information and practical recommendations to enable them to help patients with diabetes participate in fasting during Ramadan while minimising the risk of complications. The guidelines cover several key topics, including epidemiology, the physiology of fasting, risk stratification, nutrition advice, medication adjustment, and the implementation of recommendations. One of the recurring themes throughout the guidelines is the importance of individualisation and education within a diabetes management plan. We hope that the comprehensive content presented in the IDF-DAR Practical Guidelines will greatly enhance knowledge surrounding the issue of diabetes and Ramadan fasting, thereby empowering HCPs to give the most up-to-date advice and the best possible support to their patients. Best Viewed at 1024 x 768 pixels and above. This Page loaded in 0.08717 seconds on Fri, Apr 19, 2019 (06:22).